Home Columns The Flower Pot Kittens! Eric and Susie were mystified when their dogs began circling around a large 5-foot tall pot on their patio in a Palm Desert Country Club. The two Havanese pups barked at the pot, and got up on their hind legs in an effort to climb inside. The couple looked inside the container with a flashlight and saw a pair of eyes glowing back at them from the darkness within. They looked further, and discovered there were four very tiny kittens inside. When they saw the placenta was also in the pot, they realized the tiny animals were newborns. Towards the end of April, snowbirds Eric and Susie prepared to leave the Coachella Valley for their second home. These ardent animal lovers were running out of time to figure out a rescue plan for the family of cats living inside the pot. They hosed down the pot with cold water and misted the inside. The weather was turning warmer, and they desperately called local rescue groups for assistance. A neighbor told them about Mary Ewing at Loving All Animals. Mary organized a team of cat trappers who went out to the property. They developed a plan to catch the little kittens. Trap ready, they turned the pot on its side, but the little creatures did not come out. Finally, with permission of the owners, they broke the bottom of the pot and scooped up the tiny kittens. Left there much longer, the tiny animals would have perished from heatstroke. It is believed the kittens were born inside the pot. The beautiful kittens are now in a foster home and have been to the vet for a wellness check. There are two orange tabbies, a Tortoise shell Calico, and a tuxedo, a variety that could mean two different fathers. Two of the kittens are males, and two are females. To end the cycle of overpopulation, they will be spayed and neutered prior to adoption. It is estimated that mama cat is only 8 months old. An evaluation of mama indicates she has the potential to become socialized as a family pet. Therefore, she will be vetted and adopted in a family home. In a nation of “pet lovers” the overpopulation of cats results in tragic consequences for them. Only 25% of the millions that end up in America’s public shelters make it out alive. Underage kittens and puppies (8 weeks old or younger) are routinely euthanized at public shelters throughout the country, unless a foster home can take them. WHAT DO YOU DO IF YOU FIND NEONATAL KITTENS? Don’t pick them up right away. Underage kittens have the best chance of surviving if kept with their mom, and she could be nearby. Watch and wait at a distance to see if she returns after she hunts for food. If you determine they are truly abandoned or in danger, bring them indoors and commit to caring for them or seek help from a rescue group. You need to get information about proper bottle feeding, and act quickly as very young kittens need food every two to three hours. If you find the mother cat and she’s friendly, bring the whole family indoors and keep them in a spare room or the bathroom. Contact a local rescue group for help. If the mother cat is feral, leave the family outdoors, but provide water, food and shelter. When the kittens start to run around on their own they can be caught and moved inside to socialize to people. The mother cat can be trapped, spayed, and returned to the same outdoor location by a Trap/Spay/Neuter/Return program. A new program in the Coachella Valley provides trapping, sterilizing, vaccinating, and microchipping for free roaming cats. This Community Cat Program, operated by Best Friends, can be contacted at their hotline number (760) 507-1228. 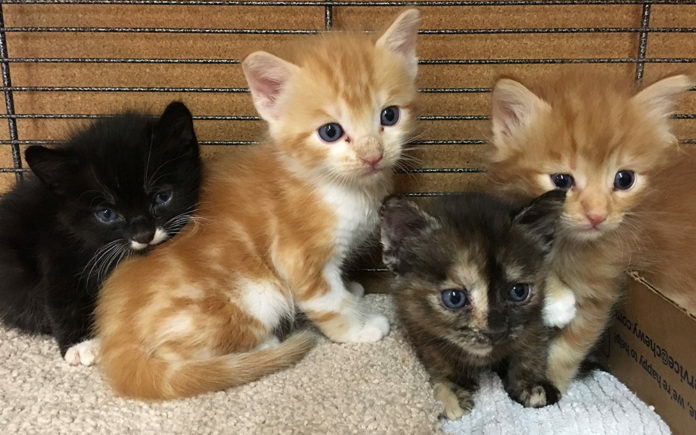 These lovely kittens will be available for adoption in about 3 weeks. For information about adopting one or two of the “flower pot kittens” call Loving All Animals at (760) 834-7000, www.lovingallanimals.org. Next articleCelebrate the Divine Feminine in All of Us!